Incessant chants of “Find a Way,” resonated throughout Graham High School’s football stadium Friday night after the Williams Bulldogs beat the Red Devils 18-14. It was the first game that the Bulldogs played after their senior captain and quarterback Harry Cohen died Monday night. Hopes for a win were as high as the arms of those who held “fives” in the air, Cohen’s jersey number. His physical presence existed in the form of buttons, shirts, face paint, sweatbands, and a gold number five that floated above the bleachers until it was released after the final buzzer. Originally leading the game, the Bulldogs eventually fell behind to the Red Devils. Similar to the fight seen within Cohen during his last game against Southern Alamance, the Bulldogs would not accept defeat. The fourth quarter resembled nothing short of the most nerve-racking action packed scenes from a Hollywood film such as “Remember the Titans,” or “Friday Night Lights.” But the tenacity and heart visible on the field was very much a reality. 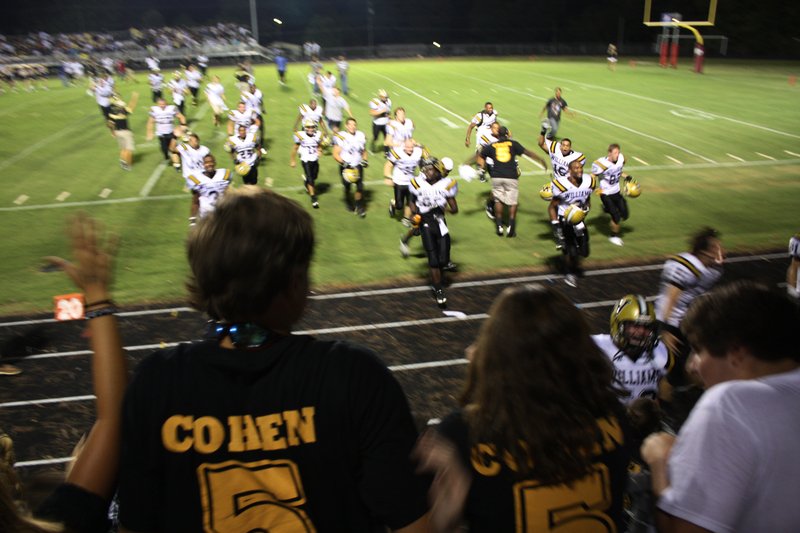 After the game as students raced around the track for a victory lap and teammates held onto each other in heartfelt grips, the legacy of Harry Cohen was shining more brightly than ever before as smiles flashed back and forth within the crowd.